said Bob Finlayson, photographer for The Australian newspaper, arranging me against bits of picturesque fencing outside the Writing Room. I'll have to also learn to keep my eyes open when the camera clicks, and practise a non-wooden smile. Or just any kind of smile, really, when there's a camera around. The profile, by Rosemary Neill for the Review section, will come out in mid-December. English in Australia is the journal of the Australian Association for the Teaching of English (AATE). Ernie Tucker has a regular column in it, "On Books", and Allen & Unwin (thanks, Julia!) have just sent me a copy of the one he wrote for the Spring issue. Only one reviewer in Year 9 didn't like the book, while all the others, from formidable readers in Year 7 to very thoughtful readers in Year 11, responded with enthusiasm. And they didn't identify with the characters. Faced with one of a reviewer's most difficult tasks, writing about a collection of ten complex stories, they praised the writer for the difficulties she had placed in the way of their reading, and they enjoyed the challenge. The absence of time and place, a context, makes black juice a beautifully crafted global text. It is about more than one culture...it is about all of us...it is about human instinct and the sensations of friendship, love, kinship, loyalty, hope...Lanagan's language leaves gaps that you are enticed to fill...There is an excitement and satisfaction when you suddenly understand what is happening. These and other quotations are treasure - because I haven't been out in schools this year, I haven't heard much in the way of reactions from YA readers. A lot of reviewers have had opinions on younger readers' behalf, but I haven't heard much directly. Very reassuring. I always work intuitively without much knowledge of where I'm going. I find that if I insist too strongly from the outset it won't take on the life that a novel needs to have. I find that by writing in the dark and coming up with a big messy first draft and reshape and rework I stand the best chance of coming up with a book that's a little smarter than I am. That may be useful to others struggling with novels. There's always a point during the writing when the book falls apart, which is a difficult period and no fun, but what actually happens is the novel is outgrowing my idea and taking on a life of its own. All novelists are heroes. Blessings on your efforts. I’d like to write a novel, I suppose, but my approach so far is just to find something that interests me, and see how much weight it will bear. Generally, the answer is: Not much. The ideas that interest me are generally “fast-twitch” ideas — they are like those little wind-up toys, which, wound up, then quickly go right under the couch. That’s an aesthetic I understand. Currently I'm sipping CivilWarLand in Bad Decline to make it last. Then I will pause. Then I will slowly sip Pastoralia. 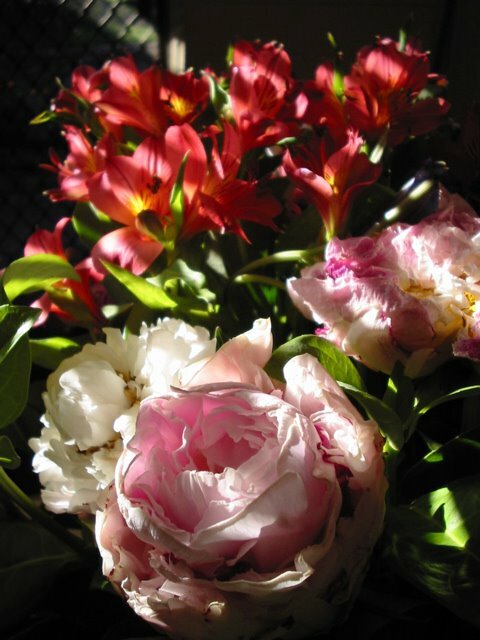 The hot weather yesterday frazzled my flowers, particularly the peonies and the irises, but Steven took a few pictures of their last gasps. 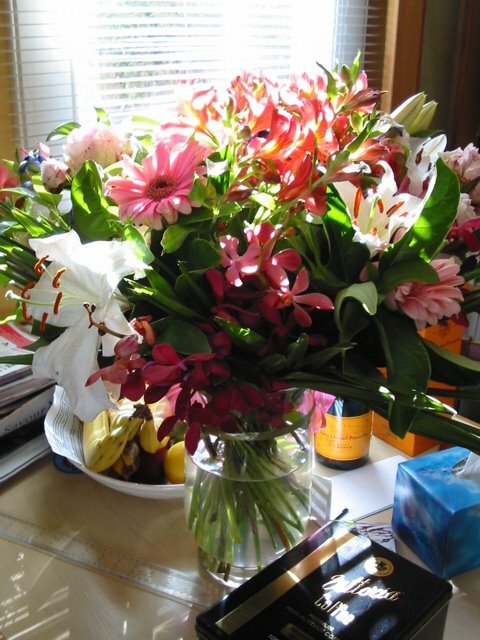 This second one has signs of celebration in it - the empty Veuve bottle, the bananas, the coffee tin full of biscuits, the ruler, the box of tissues. You know how it goes. See that circle, "NEW FLAT 54KM RIDE OPTION" up the top there? I rode that on Sunday. It's part of the MS Sydney to the Gong Ride. And I didn't die. Amazing. 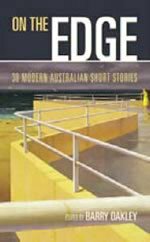 The Five Mile Press just sent me my complimentary copies of the Barry Oakley-edited anthology On The Edge: 30 Modern Australian Short Stories. Which is surprising, as I only got asked for permission to use the story in it a few weeks ago, but here it is. The story they used was not "Singing My Sister Down", for a change; it was "Earthly Uses" (the one about angels). To say Margo Lanagan's "Earthly Uses" belongs to the fantasy/horror genre doesn't do it justice...Terry Dowling's "One Thing About the Night" is likewise so powerfully imagined that it too resists categorising. It's also nice to be one of 6 out of the 30 to be named on the cover, alongside Lily Brett, Peter Goldsworthy, Cate Kennedy, David Malouf and Peter Corris. That's new, for a mainstream anthology. I must have Made It or something. Every one of these brilliant narratives focuses upon people living on life's edge in some way or another. All are facing a form of danger, whether it be physical, emotional, psychological or from beyond the world we understand. Acclaimed author and editor Barry Oakley has chosen each tale not only for its entertainment value but for the deep insights it offers into the minds of people coping with the greatest challenges their lives can produce. The result is a collection of work by some of Australia's foremost writers whose gifts, in many cases, are also recognised far beyond our shores. 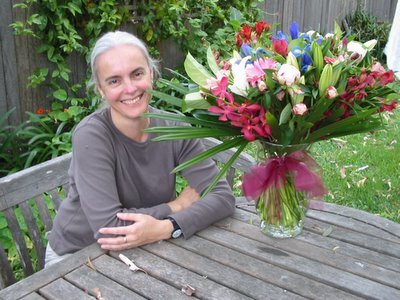 Via Cheryl Morgan's Emerald City Weblog, I've just learned that I'm now a World Fantasy Award-winning author. Not just once, but twice, for Best Collection and Best Short Story. My biggest problem with this story? It's moving too damn slow. I blame that on my subconsciousness' inability to communicate. It's 10.15 a.m. Work avoidance? Moi? Monday and Tuesday I piked on going back to the novel - or rather, I looked at it miserably for a couple of hours and then had a sudden, irresistible urge to write the changeling story. Which I did. It's called 'Daughter of the Clay' (with apologies to Garth Nix) and I'm very happy with it, although the last scene, where she's back in Fairyland missing her earthly mother and father is a bit weak yet. Her clay-ey-ness is good, and the dragonfly-like fairies. Maybe it was the air-conditioning vents brought the words to me. Maybe it was the secretive softness of the women's voices, made my ears stretch to hear. I stopped trying to push the doll's arm through the narrow, spangled sleeve. I lifted my head. Were you not able to have other children? she asked my mother. Oh, I suppose I was able. I was afraid, though. I was afraid they would all turn out the same. Like Cerise. I think that the one false signal that this discussion might give is that the whole journey was more straightforward than it really was. Some of the earlier notes were much more confused and less focused than this. The process is muddier than even this indicates, and I know that this is muddy. The confusions and the darkness...this seemed more focused and direct than I think the process is. There's this question people have, how should I really be doing this? Students always think when they're proper writers their self-doubt and their uncertainty will go away. I say to them, this is what you're choosing for your life. You think you feel bad now, you wait. Because that's the nature of writing.